The author believes that all human life and thought depends on the first three chapters of the book of Genesis. Friends testify to these passages and address separation from the Creator. 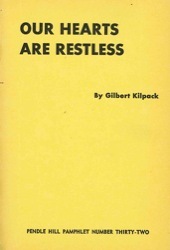 Gilbert Kilpack was born and raised in Portland, Oregon. He did his undergraduate work at the University of Oregon and received an M.A. degree from Oberlin College in the Philosophy of Christianity. He spent five years as the executive secretary of the Stony Run Friends Meeting in Baltimore. He joined the Pendle Hill staff in 1948, becoming the Director of Studies in 1954. He also lectured on Christian literature of the 17th Century, classic devotional literature, Russian literary religious classics and spiritual themes in the modern novel. He gave the Philadelphia Young Friends Movement’s William Penn Lecture in 1946, The City of God and the City of Man, which addressed the issues raised by the bombing of Hiroshima and Nagasaki.